With Gov. Roy Cooper’s Leandro-related commission prepping to begin its work this week, a scathing op-ed this weekend from a longtime follower of North Carolina schools says the state must consider children’s health and well-being issues when preparing its recommendations. Otherwise, the state will continue to fail in its court-ordered mission to provide a “sound, basic” education for all. The piece was authored by Jonathan Sher, the former president of the N.C. Child Advocacy Institute, since renamed N.C. Child. And it comes after more than two decades of court wrangling over the 1997 Leandro decision, a pivotal case that reshaped how state policymakers discuss the challenge for many low-wealth North Carolina school districts. The case, and its offshoots, persist today. As Policy Watch reported last month, parents in Halifax County are appealing a case to the N.C. Supreme Court over whether or not county commissioners bear responsibility for funding disparities in the county’s three racially-distinct school districts. 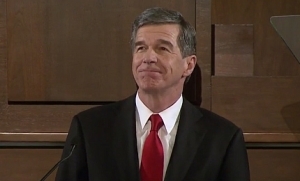 Cooper’s commission starts without the backing of the Republican majority in the N.C. General Assembly, so it will be interesting to see how much the panel’s work will impact the issue in the legislature. In 1997 – before today’s high school seniors were even born – the N.C. Supreme Court ruled that every child in North Carolina has the constitutional right to a “sound, basic education.” That was the essence of its “Leandro” decision. Twenty years later, this right continues to be violated. Much of an entire generation of post-Leandro children and young people did not receive what the N.C. Constitution “guarantees” them all. This sad reality diminishes the lives and life chances of hundreds of thousands of young North Carolinians. But, the loss is not theirs alone. As a collection of communities from Manteo to Murphy, as an economy and as a society, the costs of inaction are both large and largely hidden. The visible costs appear in school budgets. The more expensive, invisible ones appear in health care, welfare, criminal justice and substance abuse expenditures that could have been avoided. The “opportunity costs” – especially the wasted talent and productivity of students who did not receive a sound basic education during these decades – are rarely acknowledged. Twenty years of failure to meet the Leandro standard prompted Gov. Roy Cooper to try a new approach outside the courts. The high level commission he appointed will meet for the first time after Thanksgiving. Its mission is to figure out how to put together all the pieces required to make this constitutional right a reality. As with any jigsaw puzzle, it helps to have the complete picture in mind when arranging the pieces. And yet, that big picture has had a gaping hole in it from the outset. Without these missing pieces, the Leandro puzzle cannot be solved. Improving the health and well-being of N.C. children and young people has always been, and remains, the huge missing piece. Preventing harm to students from the earliest possible point in their lives – and safeguarding their well-being while improving their health at every stage of development – has simply not been a priority within the Leandro agenda. Both sides have allowed this landmark N.C. Supreme Court ruling to be reduced to a debate about school finance, classroom resources and staff quality. Of course, the quality of teachers, principals and resources are absolutely essential. But they are not the whole story. Twenty years of fighting over these issues has demonstrably not enhanced the lives and life chances of N.C.’s children and adolescents, especially the most vulnerable ones. There are mountains of evidence that prove the links between health/well-being and education achievement. Honestly, however, these profound connections are just common sense. Who really believes that children whose health and well-being have been compromised are the ones most likely to thrive academically? Everyone already knows that children harmed by birth defects, chronic health problems and maltreatment are walking a dramatically rougher road to success in school, work and life. Many of these adversities were preventable, but not prevented. Ironically, perhaps, the Leandro Commission’s “health representative” was appointed as its chair. Brad Wilson is the CEO of Blue Cross Blue Shield of North Carolina. He is a politically savvy, highly successful corporate executive. Nonetheless, Wilson would not consider himself to be a top expert on child development or adolescent health. Happily, commission members – who bring a wealth of diverse knowledge, experience and wisdom to the table – can choose to ask North Carolina’s array of public health, medical and developmental experts for the best available information and advice. This, in turn, will allow them to connect the dots (at long last) among health improvement, child well-being and Leandro implementation. They have the opportunity to make this connection a cornerstone of their deliberations. But will they? They may be encouraged to do so if they recall that some of the most important actions to support a sound basic education were accomplished by NC Health Choice for Children. In its initial years, more than 10,000 children from working poor families received their first prescription eyeglasses – and over 1,000 got their first hearing aids. Might their previous lack of access to such basic health resources better explain their lack of education progress than the quality of their classrooms? 1. “Primary prevention” of (i.e., nip in the bud) those pre-birth and early childhood health problems that are preventable. Keeping gaps from opening in the first place is always less expensive and more effective than trying to close them later. 2. Federal reauthorization, and state implementation, of a robust Child Health Insurance Program (NC Health Choice for Children). The gains already made must not be lost. CHIP’s federal funding ended on Sept. 30. Despite bipartisan support, key parts of the CHIP legislation that would help Leandro’s intended beneficiaries are under attack right now. Blue ribbon commissions are often viewed as fig leaves to cover up and delay meaningful action. North Carolina’s new Leandro Commission has a golden opportunity to prove the cynics wrong by making a powerfully positive difference. After all, a sound basic education for everyone is not just a good idea anymore, it’s the law. However, this opportunity hinges on the commission’s willingness to add, and give equal weight to, the health and well-being pieces needed to solve the Leandro puzzle. Doing nothing more than polishing and rearranging the same old pieces will predictably consign even this stellar commission to the scrapheap of well-intentioned efforts that didn’t end up mattering.